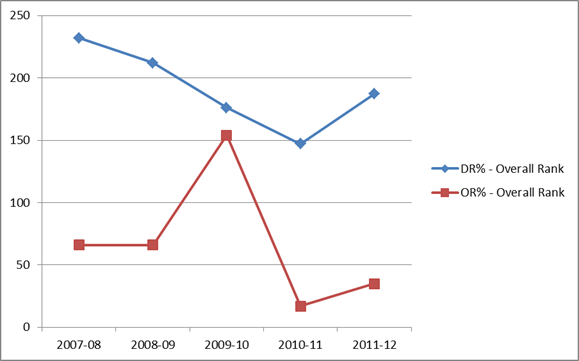 In recent years, Minnesota teams have excelled at blocking shots and offensive rebounding. Contrary to what you might expect, however, the defensive rebounding of the Gophers has ranged from mediocre to poor when compared to the rest of the Big Ten and other D1 teams. 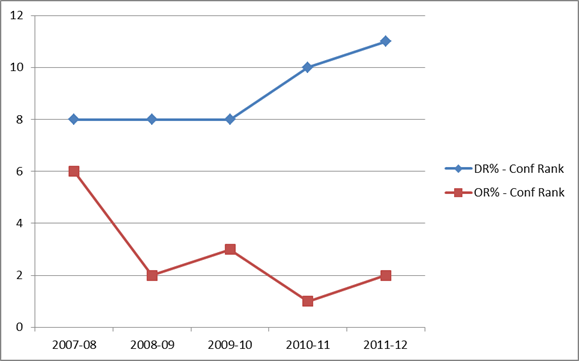 So far in 2012-13, these trends have continued. According to StatSheet.com, Minnesota’s offensive rebounding percentage this year is second best in the nation and tops in the Big Ten. On the defensive boards, the Gophers are dead last in the Big Ten and one of the worst in the nation at 329. Minnesota’s performance on the defensive glass isn’t skewed by a game or two. In fact, the team’s defensive rebounding percentage has been better than the national average in only one game this year (Toledo). As illustrated in the tables below, during Tubby’s years as head coach the team’s offensive rebounding percentage has been impressive while their defensive rebounding percentage has been relatively poor. A renewed focus on defensive rebounding could be directed by the coaching staff, but how much might stressing this area hurt the team’s transition into their offense? Minnesota has been particularly successful this year when they strike quickly after a defensive rebound. According to Hoop-Math.com, the Gophers have an effective field goal percentage (eFG%) of 73% this season when they shoot within 10 seconds of a defensive rebound. Last year, that figure was 54%. The figure of 73% eFG% is going to fall as the season goes on as it’s been boosted by an unsustainable 59% 3-point conversion rate. Still, for a team that is often stale in half court sets, anything that detracts from their ability to score in transition could do more harm than good. Better utilization of the roster, especially Trevor Mbakwe. He’s one of the better rebounders in the college game and should be playing 30+ minutes per game, not fewer than 20. Centers Elliot Eliason (15.8 mpg) and especially Maurice Walker (7.8 mpg) could be given more minutes. At times, we believe it will be appropriate to play one of these two along with Trevor Mbakwe and Rodney Williams. Push the others to improve their tenacity and consistency. Rodney Williams (who has been sensational in most aspects of his game), Andre Ingram (8% DR%) and Joe Coleman all need to improve their contribution on the defensive glass. In the last four games, Minnesota’s opponents have pulled down offensive rebounds at a 39% rate in the first half, but the percentage jumps to 52% in the second half. What do you think? CONTACT US with your thoughts on this and other articles, as well as any suggestions, comments and critiques. Using KenPom.com data through games of November 29, 2012, we looked at who makes up the top 48 defensive rebounders in the Big Ten. Only those who have played in at least 40% of their team’s minutes were included. If all teams were created equal, we’d expect four players from each of the 12 Big Ten teams to be listed. All but two teams are within one of that expectation (i.e., 10 teams have three, four or five players in the top 48). The outliers are Penn State (six) and Minnesota (one). For the Gophers, Maurice Walker would be in the Top 10, but has played in less than 20% of the team’s minutes. Elliot Eliason is just short of 40% in minutes and ranked at #30.